Laid back Irish bar in southwest Auckland. Warm and welcoming, with outside seating, friendly staff, great drink selection and delicious food. Pool table and live music also add to the Irish vibe. 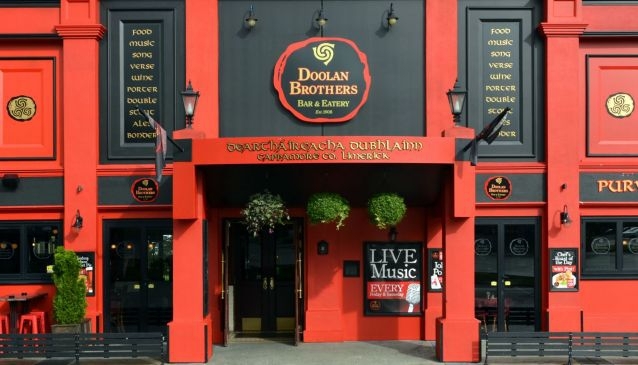 Doolan Brothers Lynfield is the perfect place to unwind with an after work pint of the black stuff. It's also pretty handy for shoppers who want to take the weight off for an hour as they browse the nearby retail park. The bar is a paean to the traditional Irish, rustic bar scene - dark wood, bar stools, large mirrors and a fantastic roaring fire in the huge stone chimney breast. There's outdoor seating for those lovely warm days when you want to do nothing more complicated than sit down with a cold beer and watch the world go by. Try the satisfying food menu, with delights such as risotto balls, prawn cutlets, homemade wedges and nachos. Or go large with a sumptuous Doolan Brothers burger (try Jeff's gigantic buffalo burger, if you're in need of serious refuelling...). You can even get curry here, and some more traditional roast dinners. Kid's dishes are also available for the smaller appetites. After dinner, why not challenge your mates to a game of pool in the games area, and reward the winner with a tot of one Doolan's top shelf whiskies?